To innovate future technologies while promoting a sustainable future, Princeton Satellite Systems and the Princeton Plasma Physics Laboratory (PPPL) have proposed a revolutionary direct-drive, fusion-powered rocket engine. Compact and clean-burning, the Direct Fusion Drive (DFD) can generate controllable power from 1-10 MW with high thrust and high specfic power. Check out our Mars mission!! Other possible applications include asteroid mining and space-based radar. PSS has also developed the Fusion Propulsion Module to help with fusion propulsion design. A diagram of the DFD with more information is shown below. 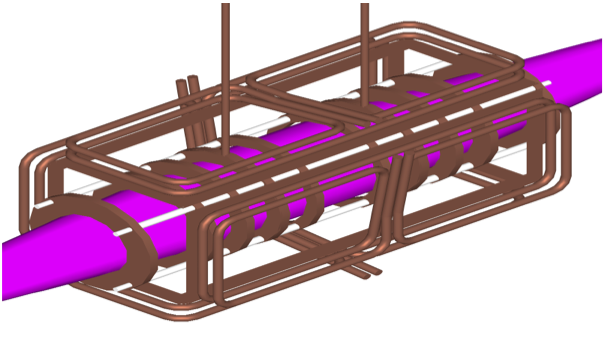 Most fusion reactor research to date has focused on the deuterium-tritium (D-T) fuel mixture. D-T produces most of its power as neutron radiation, which causes severe damage to the reactor's material and necessitate frequent maintenance and expensive part replacement. Instead, we selected the D-3He reaction, which is termed aneutronic because it does not directly produces neutrons. 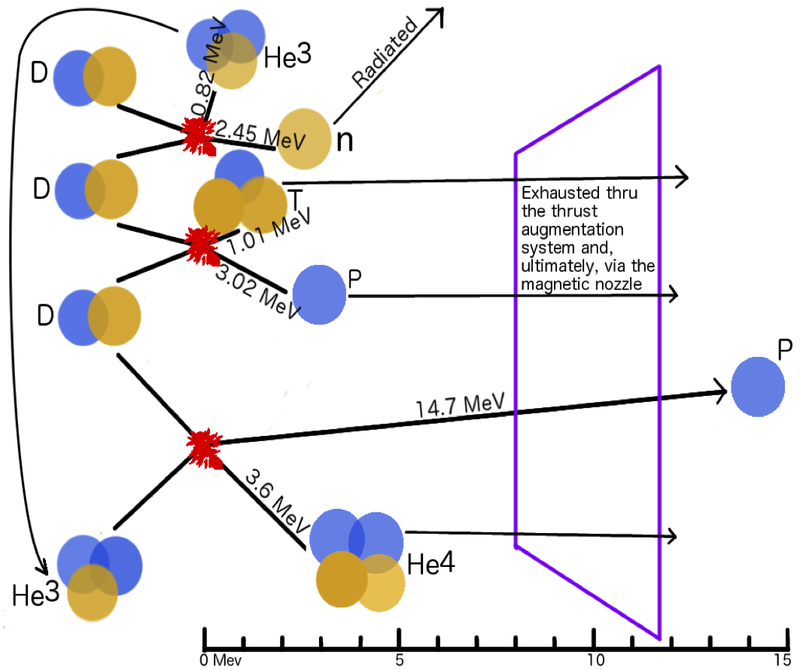 Some neutrons are produced in side reactions, illustrated below, and decreasing this neutron production even further has been one of the focuses of Dr. Samuel Cohen's research at PPPL. 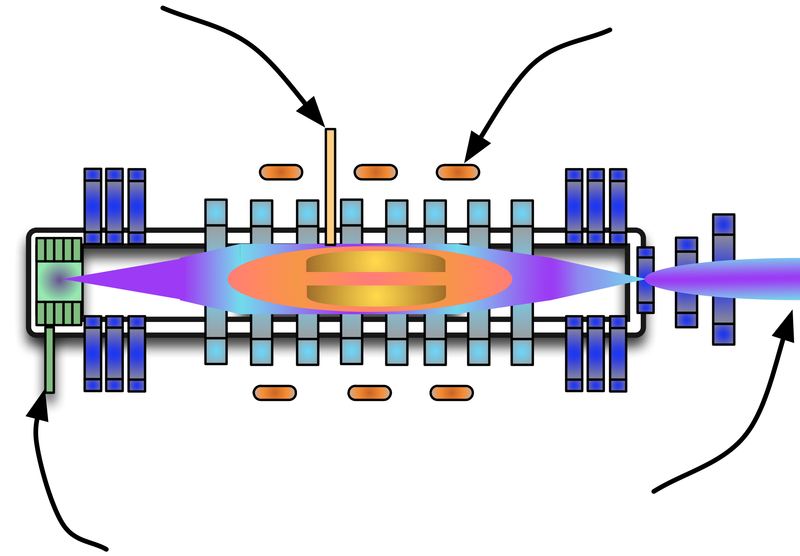 Generated through radio frequency magnetic coils, the odd-parity rotating magnetic field (RMFo) pumps up the ions to fusion relevant temperatures. Unlike other heating methods, the system promotes stability and requires a much smaller plasma volume, making RMFo more effeicient, lighter, and less expensive. The example mission is for a spacecraft to go from low earth orbit to the Sun-Earth/Moon L2 point to deploy the James Webb Space Telescope (JWST). The spacecraft would enter an 800 by 800 km halo orbit about L2 at that point The spacecraft acts as a ferry and returns to low-earth orbit for refueling and further missions which might include servicing the JWST. The following images show the fusion engine with fuel tanks attached to the James Webb Space Telescope. 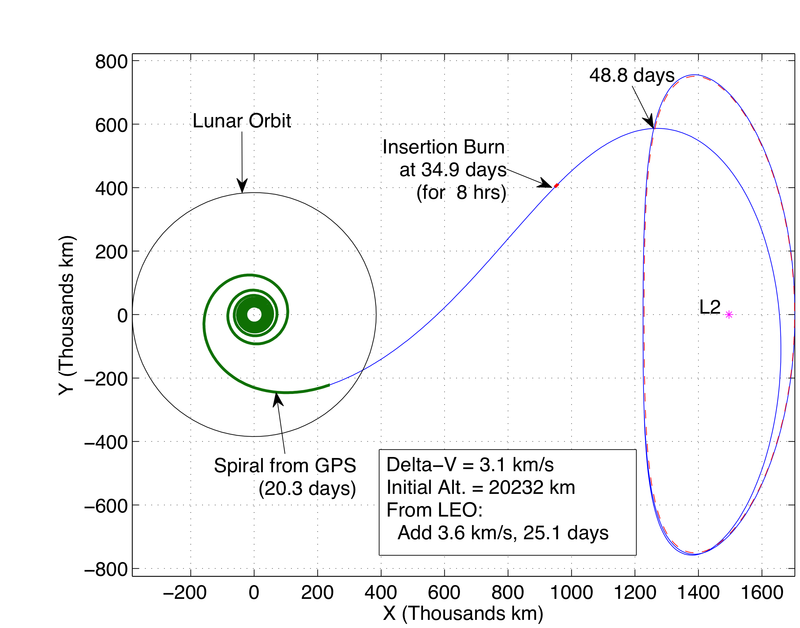 The fuel tanks are sized for a 12 km/s delta-v, in excess of that needed for the round trip for this mission. 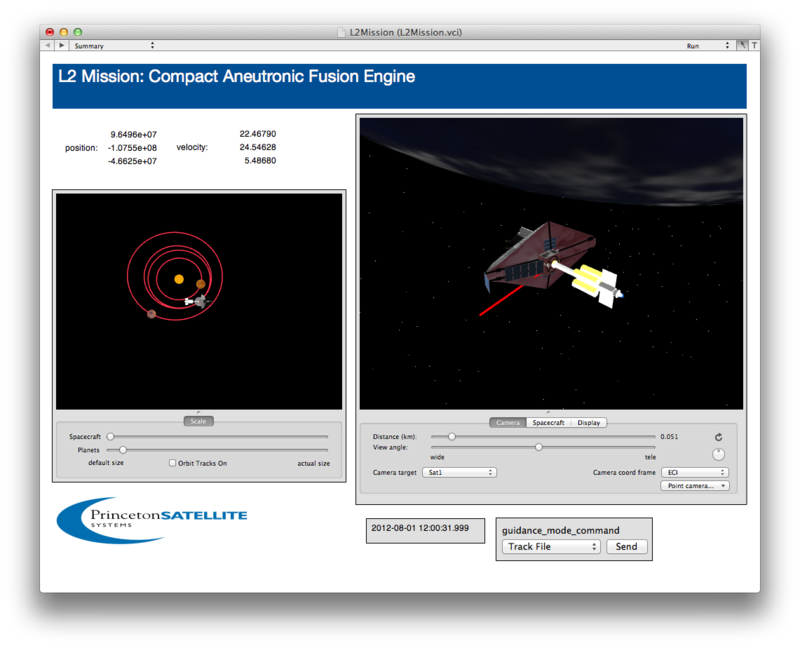 The second images shows the spacecraft in its VisualCommander simulation. The display on the left shows the position of the spacecraft and planets in the heliocentric plane. The display on the right provides a close up 3D view of the spacecraft and planets. 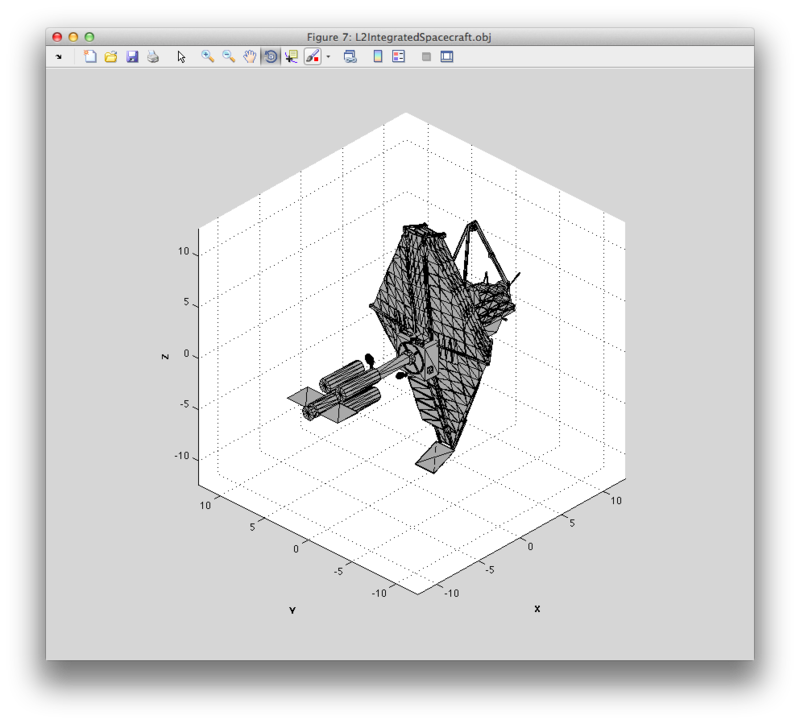 The popup menu in the lower right corner allows the user to command several different types of guidance profiles. New Scientist: "Our top 5 wacky NASA missions that might just happen," which includes the DFD Pluto mission. Time.com: Going to Mars via Fusion Power? Could Be. September, 2013. Alternative Fuels Focus of Workshop April 24, 2013. New York Times article that discusses the 100 Year Starship Symposium October 18, 2011. Some of the information in the article may have come from our paper. Slate article that mentions our 100 Year Starship Symposium paper, "Modular Aneutronic Fusion Engine for an Alpha Centauri Mission" October 5, 2011. A direct fusion drive for rocket propulsion, Yosef S Razin, Gary Pajer, Mary Breton, Eric Ham, Joseph Mueller, Michael Paluszek, Alan H Glasser and Samuel A Cohen, Acta Astronautica, Number 1, pp 145--155, December, 2014. 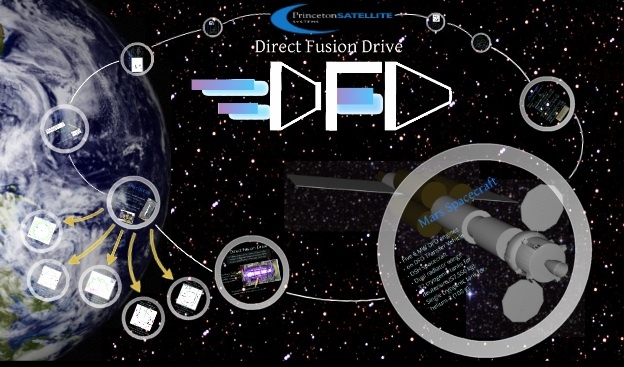 Direct Fusion Drive, presented at the 20th Advanced Space Propulsion Workshop, S. Thomas, M. Paluszek, and S. Cohen, November, 2014. Direct Fusion Drive for a Human Mars Orbital Mission, Michael Paluszek, Gary Pajer, Yosef Razin, James Slonaker, Samuel Cohen, Russ Feder, Kevin Griffin and Matthew Walsh, International Astronautical Congress, October, 2014. Compact Aneutronic Fusion Engine, Y. Razin, M. Paluszek,	E. Ham, G. Pajer, J. Mueller, S. Cohen, A. H. Glasser International Astronautical Congress, Naples, October 2012. Modular Aneutronic Fusion Engine, G. Pajer, Y. Razin, M. Paluszek, A. H. Glasser, S. Cohn, Space Propulsion 2012, May 2012. Modular Aneutronic Fusion Engine for an Alpha Centauri Mission, M. Paluszek, S, Hurley, G. Pajer, S. Thomas, J. Mueller, S. Cohen, D. Welch, DARPA 100 Year Starship Conference, September 2011. Magnetic Fusion Engine, N. N. Gorelenkov, L. E. Zakharov, M. A. Paluszek and P. Bhatta, Magnetic Fusion Engine, in Proc. 43rd AIAA Joint Propulsion Conference, Cincinnati, July, 2007. The Grand Challenge: A New Plasma Thruster, Cohen, S.A. and M. Paluszek, Launchspace, December 1998, pp. 46-50. "In Space Startup Method for Nuclear Fusion Rocket Engines," Paluszek, M., Ham, E., Cohen, S., and Razin, Y. Patent Pending, August 2013, Publication Number 20150055740. "Method To Reduce Neutron Production in Small Clean Fusion Reactors," S. Cohen, Patent Pending, US 13/33767, 2012. "Method To Produce High Specific Impulse and Moderate Thrust From a Fusion-Powered Rocket Engine," S. Cohen, G. Pajer, M. Paluszek, Y. Razin, Patent Pending, US 61/645459, 2012.